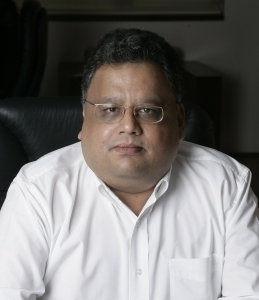 SpiceJet Ltd (BSE: 500285) counter in BSE, on Monday, witnessed a large buy of 25 lakh shares by Rare Enterprises, the investment company of celebrity investor, Rakesh Jhunjhunwala. The deal was disclosed at Bombay Stock Exchange after trading hours on Monday. There were no identifiably large sellers offloading more than 0.50% stake on Monday. Rare Enterprises bought the 0.52% stake at Rs. 30.77 a share, making the deal worth Rs. 7.69 crore. As per the latest shareholding pattern available, updated as of Q1 end, neither Rare Enterprises nor Rakesh Jhunjhunwala or his identifiable family members were major investors in the Indian airline company, holding above 1% stake. Earlier in the day, SpiceJet published a turnaround result for the first quarter of this fiscal, causing its stock to recover from a recent deep fall, and rally by 22.42% in BSE. SpiceJet’s turnaround into profits, after five consecutive quarters of losses, also caused other Indian airline stocks like Jet Airways (BSE: 532617, NSE: JETAIRWAYS) and Kingfisher Airlines (BSE: 532747, NSE: KFA) to trade higher, on hopes that the beleaguered Indian aviation industry may be poised for a turnaround. SpiceJet’s performance in Q1 is indeed inspiring for airline investors, as most key headline numbers as well as key finer metrics are up. Sales at SpiceJet is up by 51% on a year-on-year basis, while from a quarterly net loss position of Rs. 71.96 crore during last fiscal’s Q1, now it is Rs. 56 crore of net profit. Number of passengers carried rose by 26%, while average revenue per passenger rose by 24%. Seat factor is up by 1.4% to reach 80.3%. While all these metrics are comforting to the airline industry, SpiceJet also exhibited better competitiveness by increasing its market share by 1.5% to reach 18.6% during Q1. Now promoted by Kalanithi Maran, the Chennai based billionaire businessman with strong political roots, SpiceJet is the country’s second largest low-fare airline, behind IndiGo. However, unlike IndiGo, most low-fare carriers including SpiceJet were losing money continually. Today’s buyer into SpiceJet stock, Rakesh Jhunjhunwala, is not a major investor in any of the listed airline stocks till now. Considered a judicious investor by many, his selective entry into the airline industry now is worth noting. However, his buy on Monday, is a typical smallest-possible identifiable buy, as in the Indian market, only buys above 0.50% stake are thus identified. What this is likely signalling is that he or his company Rare Enterprises, might have made unidentifiable smaller buys at much lower levels, earlier. SpiceJet stock had also rallied steadily during the past seven months, from a 52-Week Low of Rs. 15.35 during late December to a 52-Week High of Rs. 36.15 in early July, which is a nearly 136% gain. But during last week, the stock had witnessed some strong selling and plunged, due to news reports that promoter Kalanithi Maran has been interrogated by CBI in the controversial Aircel-Maxis deal. Earlier, the investigative agency had registered a case against Kalanithi and his brother Dayanidhi Maran who is a former Union Minister of India. The investigation is still going on. Known for the political patronage he enjoys, as well as his strong business acumen, Kalanithi Maran is also the promoter of Indian media giant, Sun Group. At Sun’s listed arm, Maran and his family are known to draw some of the highest possible salaries in corporate India. The promoter group headed by Maran holds 48.59% stake in SpiceJet, of which 58.57% is pledged. He had acquired a controlling stake in SpiceJet during June 2010. Amidst the euphoria of the turnaround quarterly results, SpiceJet also cautioned regarding the strong headwinds facing the Indian airline industry, including high cost of operations, expensive aviation fuel prices, higher airport charges, and a weakening rupee. It also declined to provide guidance for the next quarter citing highly volatile operating environment. Large institutional investors in the SpiceJet counter are Reliance Capital Trustee Company, Ewart Investments, Sundaram Mutual Fund, SBI Magnum, & College Retirement Equities Fund. On Monday, SpiceJet closed trading in BSE at Rs. 30.85, up by 22.42%.